This page describes the initial bringing up (designing and installing firmware and software) that will give Rhococo its functionality. First we have to install the tools we need. 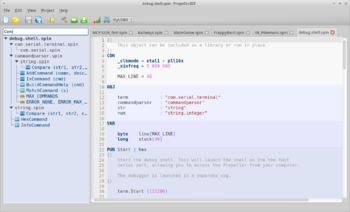 For programming the propeller we have to install the propeller IDE, https://developer.parallax.com/propelleride/ . Fortunately I have already installed the latest version, when doing some initial research, and I have it working with my propeller based game development system, I bought some ten years ago, when thinking about building my own home computer was still a pipe dream.